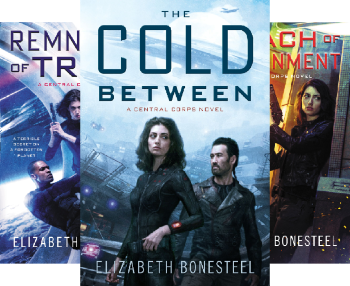 This third novel in Elizabeth Bonesteel’s CENTRAL CORPS series needs to be read after you’ve finished the previous novels, The Cold Between and Remnants of Trust. When publishers make promises such as “a page-turning hybrid combining the gritty, high-octane thrills of James S. A. Corey and the sociopolitical drama of Ann Leckie” I just can’t help but point out when the book doesn’t deliver. I have enjoyed Elizabeth Bonesteel’s CENTRAL CORPS novels enough to continue the series when I already have the audiobooks loaded onto my phone, and I was multi-tasking by doing a jigsaw puzzle at the same time, but that’s about it. I object to the descriptors “page-turning,” “gritty,” “high-octane-thrills,” and “sociopolitical drama,” almost as much as I object to the comparisons to James S.A. Corey and Ann Leckie. It’s false advertising. 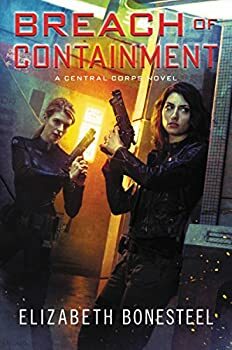 But for those who’ve enjoyed this trilogy so far, the good news is that Breach of Containment will deliver what you’re hoping for, and probably more since the stakes have increased dramatically. Earth is now in danger and Elena and Greg must save the day. As the story opens, we meet a couple of scavengers who find a strange little box that makes them feel weird. One of the scavengers knows Elena, our heroine from the first two CENTRAL CORPS novels. She has now left Central Corps and is working as an engineer on a freighter called Budapest which happens to be on its way to the scavenger’s planet. The scavenger contacts Elena to alert her to some concerns involving nukes and, when she arrives, it’s obvious that something nefarious is going on. Meanwhile Greg, who hasn’t talked to Elena in a year, is still the captain of Galileo. He gets a distress call from the captain of a PSI ship who tells him that their sister PSI ship is acting strangely. So that is something to investigate (without orders) and then when Greg realizes that Elena may be in trouble, he goes in to rescue her (without orders). (The military structure, as I’ve mentioned before, is really confusing. Greg’s people are constantly going off to do their own things. What kind of military operation is this?) As expected, these sub-plots collide in what is supposed to be dramatic fashion. All this brings Greg and Elena back together again. Their relationship has been at a constant will-they-or-won’t-they stagnation for three books now. It’s hard to believe in it, actually. I never felt it. I just can’t get excited about these characters, or their relationships with each other. I’m going to use the word “bland” again. The characters are fine, but not very interesting. They brood, they try to do the right thing, but they are dull and humorless. They lack the spark that makes me want to follow them. Similarly, the science fiction mystery that underlies the whole series is somewhat, but not very, interesting. I never became totally engrossed in it, though I did want to see how it resolved. Also, I just can’t get past the sloppiness of their military operation; it’s totally unbelievable… as are the multiple coincidences that bring all these people together at the right time to solve the mystery. It’s like the events are happening in a small town instead of the vastness of interstellar space. I don’t feel the space and the way ships move around in it feels too quick and easy. But for readers who don’t mind suspending disbelief, the trilogy is pleasant enough. It’s possible that I may have liked it better if I had read it in print rather than in audiobook format. Katharine Mangold’s voice is great, but the delivery is… I’m going to say it again… bland. I can usually dissociate the author’s work from the narrator’s, but it’s possible in this case that a more engaged narrator may have made a difference here. Published in 2017. A reluctant hero must prevent war in space and on Earth in this fast-paced military science fiction thriller from the author of The Cold Between and Remnants of Trust—a page-turning hybrid combining the gritty, high-octane thrills of James S. A. Corey and the sociopolitical drama of Ann Leckie. Space is full of the unknown . . . most of it ready to kill you. When hostilities between factions threaten to explode into a shooting war on the moon of Yakutsk, the two major galactic military powers, Central Corps and PSI, send ships to defuse the situation. But when a strange artifact is discovered, events are set in motion that threaten the entire colonized galaxy—including former Central Corps Commander Elena Shaw. Now an engineer on a commercial shipping vessel, Elena finds herself drawn into the conflict when she picks up the artifact on Yakutsk—and investigation of it uncovers ties to the massive, corrupt corporation Ellis Systems, whom she’s opposed before. Her safety is further compromised by her former ties to Central Corps—Elena can’t separate herself from her past life and her old ship, the CCSS Galileo. Before Elena can pursue the artifact’s purpose further, disaster strikes: all communication with the First Sector—including Earth—is lost. The reason becomes apparent when news reaches Elena of a battle fleet, intent on destruction, rapidly approaching Earth. And with communications at sublight levels, there is no way to warn the planet in time. Armed with crucial intel from a shadowy source and the strange artifact, Elena may be the only one who can stop the fleet, and Ellis, and save Earth. But for this mission there will be no second chances—and no return. I still don’t read much military SF, but the “self-directed” nature of the characters in this series baffles me too. Maybe it would have worked better if Bonesteel had made them some special branch of planetary law enforcement or intelligence gathering, where their brief is large enough to allow some leeway for taking off “on a hunch” or something.